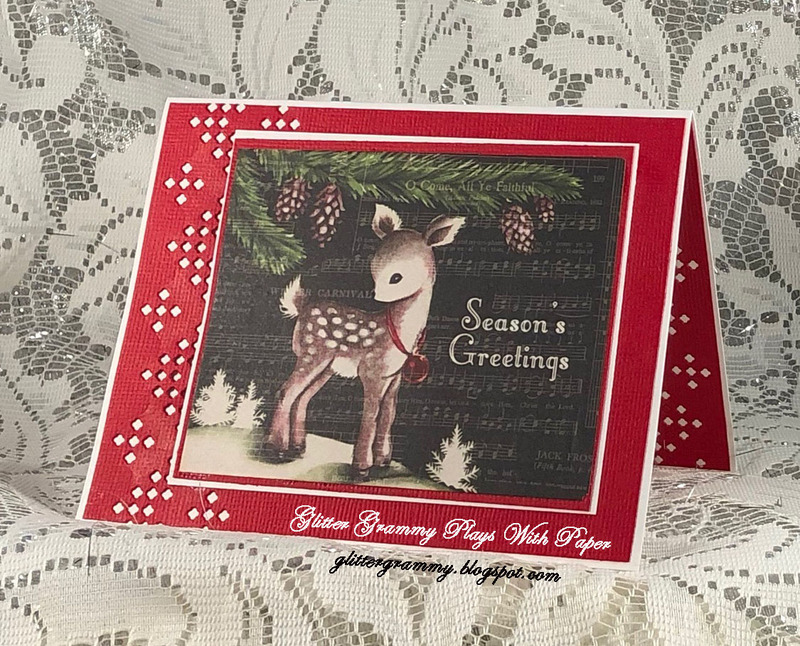 I know everyone must be thinking Easter.....and so am I, but....Christmas is also in my thoughts and this month the Sparkles Christmas Challenge is Feature a Creature. Thank you Helen for this fun challenge. 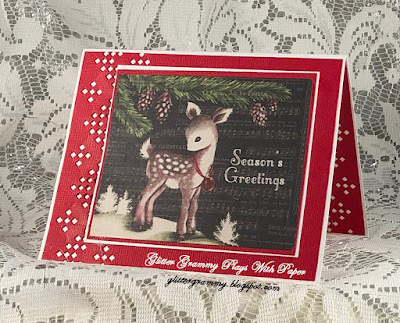 My little creature is this cute little deer graphic from Splash of Color #30691 Greetings * Decked out Collection. It is an older piece pulled from my stash. I couldn't tell you what year. My die cut border is a retired Poppystamps die, which I really really love. It is called Zig Zag Knit #949. I layered all on a cranberry colored card stock and layered it onto white. This was an easy quarter fold card to make....and I really do like it. I love the combination of red and white. Sadly, because of the layers, it will require extra postage, which is pretty normal for handmade cards...right? I'm working on a Christmas Album, which with any luck at all might actually be done by Christmas... So I guess I should get back to it. What an adorable Bambi he is and I rather like that border too. I do wish that spring would hurry up and get here for good. So fed up with the constant rain and dreary days we are having. Hugs Mrs A. Impossible Cards - I am loving making them.